Buying or servicing a car is just too important a task to leave it to just anyone. Visit the dedicated team at Harrisonburg Honda to get it done the right way. Get To Know Our Dealership Family! Welcome to Harrisonburg Honda. We are so glad you are here. We want to take a few minutes to introduce ourselves to our friends in Harrisonburg Honda. Thank you for choosing Harrisonburg Honda. We are so honored that you have selected us to be your Honda dealership of choice. We are privileged to serve you and want to make your car shopping experience the best one yet. We will work to exceed your expectations and ensure your complete satisfaction. Take a few minutes to get to know us. 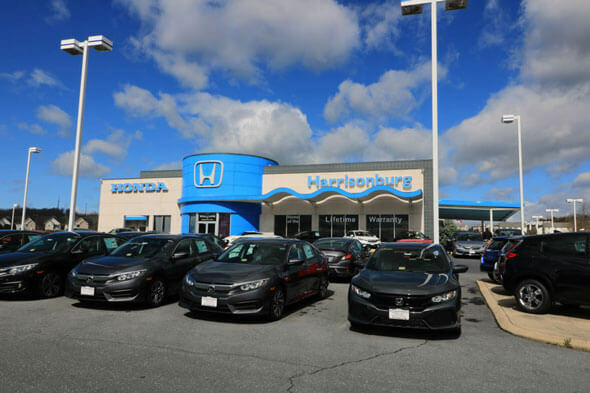 Harrisonburg Honda is proudly owned and operated by Nelson and Rose Schwartz. Nelson and Rose purchased Harrisonburg Honda back in 1994, and have lived in Rockingham County for their entire lives. Both came from humble beginnings and worked hard to achieve their goals and dreams. This included owning a Honda dealership in their hometown. They employ over 150 people and like to think of this team as family. The average employee has been at Harrisonburg Honda for 10 years or more! That says a lot about the leadership of this store. Nelson is a Veteran that is proud to have served his country and honored to give back to his community. Our dealership is lead by a team of experts. Heading up the team is Bryan Horne. Bryan, who is a Veteran himself is the General Manager and Operator of Harrisonburg Honda and has been in this role since August of 2010. He joined the dealership in 2004 and takes great pride in leading the team as well as serving the customers in the Shenandoah Valley of Virginia. This includes customers from Harrisonburg, Roanoke, Staunton, Charlottesville, Waynesboro, Winchester, and beyond. He has shown Harrisonburg Honda great leadership and has assembled a great team of experts to serve you. From our knowledgeable and friendly sales professionals and finance team to our certified service technicians and parts staff, we have a great team to serve you. Because both Nelson and Bryan are Veterans of the mighty US ARMY and have formed a bond that all “brothers-in-arms” share, they believe in giving back to our Veterans. Harrisonburg Honda truly is “Veteran Owned and Operated.” We honor our beloved Veterans and as a way of saying “thank you for your great service to our country,” all US Military Veterans receive 10% off Service and Parts at Harrisonburg Honda. We will also match all manufacturers’ Military incentives. It is just a small way we show that we appreciate these Patriots and are so grateful for their service. We also honor our Veterans by supporting causes that benefit them. It is our passion to give back to our Veterans by sponsoring organizations like K-9’s for Warriors, War Paints, Project Healing Waters, and the Dayton Muddler, benefitting Boulder Crest Retreat. We are proud to support these causes that range from service dogs to therapy by way of art and fly-fishing for our beloved Veterans. When you support Harrisonburg Honda, you are supporting the fight against the 22 Veterans that commit suicide daily. Thank you to all current, past, and future customers for your support of our cause that is so near and dear to us.